The building where Copenhagen Business School MBA students take the bulk of their classes backs on to a park next to Copenhagen Zoo. But there are no elephants in the classroom. Everyone knows why they are here: sustainability. It’s what associate dean and professor of Business in Society on the Copenhagen MBA program, Andreas Rasche (pictured below, right), wants to run through the entire program. He believes that’s the only way for a business school to send a credible message to students that they’re committed to sustainability. It was my first experience in an MBA classroom, but I was quickly shown that the MBA students from Copenhagen Business School I’ve spoken to over the past year don’t just talk the talk, they walk the walk. Quickly after Andreas’s presentation, the discussion broke out, and moved towards child labor. One student argues that children should be given access to education rather than forced into work. A classmate pushes back, claiming that this is a luxury issue—what if that child doesn’t have access to free education and instead has to work to feed and support their family? Posing the question of whether sweatshops are an appropriate way of reducing poverty then sparks further discussion—one student, who grew up in an area of India where sweatshops are prominent, brings in his real-life cultural perspective. Andreas says that this platform for discussion is the essence of the MBA classroom. It’s about the promotion of ideas, creating innovation, and forcing students to think. After the initial debate, students are walked through a case study by Andreas, before being split into groups to continue their discussion. Andreas says this is part of his plan to move away from an old-style lecture model. He says that this isn’t the case at some other business schools, where colleagues of his still teach case studies in the traditional way. “When you do this [group work], you make the students talk. When you’re teaching cases, you have to be innovative, creative. In September, The Economist’s Bartleby column—a weekly column about management and the world of work—spoke about the ‘wisdom of crowds’, and the fact that in big groups people are more aware of the views of others, and thus herd towards the majority view. Indeed, the same article referenced a paper by three American academics—Ethan Bernstein, Jesse Shore, and David Lazer—that found intermittent collaborators, those kept informed of peers’ thoughts now and then, solved challenges as much as those who worked independently, and had a better average solution. Discussion and collaboration are key aspects of the MBA at Copenhagen Business School. James Bryce Smith, a current student on the Copenhagen MBA, explains that the diversity of his cohort coaxes out the best of cultural learning during classes. 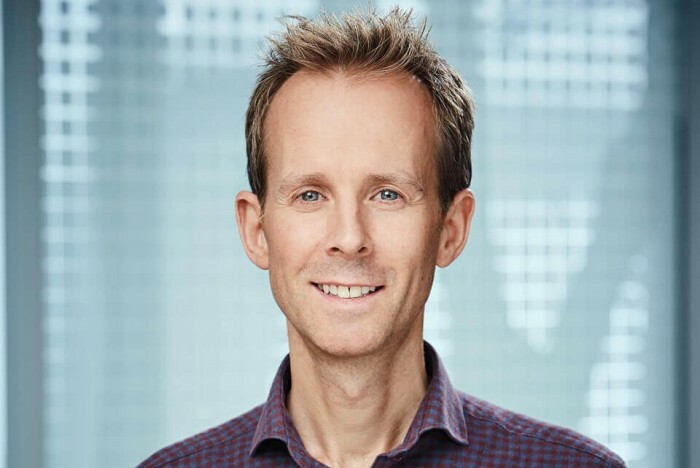 James, who has a background in marketing and chose the Copenhagen MBA to transition his career towards sustainability, adds that there is a really good balance between classroom discussions, guest speakers, and case study problems. James is keen to explore entrepreneurship during his time on the MBA, but it must be a startup with sustainability at its core. “At this stage of my career I want to make a positive impact in the world, and not just work for a traditional 20th century organization that is exploiting planetary resources,” he explains. The nature of the MBA cohort at Copenhagen Business School means he can draw on the experience of Christian Mahler (pictured below, right) one of his classmates with a background in entrepreneurship and startups in Berlin. Christian chose the program because of its keen attention to entrepreneurship. Eight weeks in, he says that the pace of learning and the breadth of topics covered means students are given a holistic overview of the business world. “It’s very fast moving,” he adds. “Personally, I am still at day one, and I really want to be open to any subject and information. I want to keep this mindset for as long as possible. Prashant Singh (pictured below, right) another current MBA student at Copenhagen Business School, echoes James and Christian’s sentiments. “The classroom and professors are so approachable,” he explains. Prashant, who has a background in engineering and worked as a consultant in India before the MBA, adds that the welcoming nature in the Copenhagen classroom makes a pleasant change from his past education. In India, he explains that you have to address your professors as Sir, or Madam. The easy communication in the Copenhagen classroom fosters an atmosphere for knowledge sharing and collaboration. Sustainability was a key pull factor in his decision to embark on the program as well, he says. “I wanted to go for something that can provide direction and, of course, sustainability, which is very close to my heart.